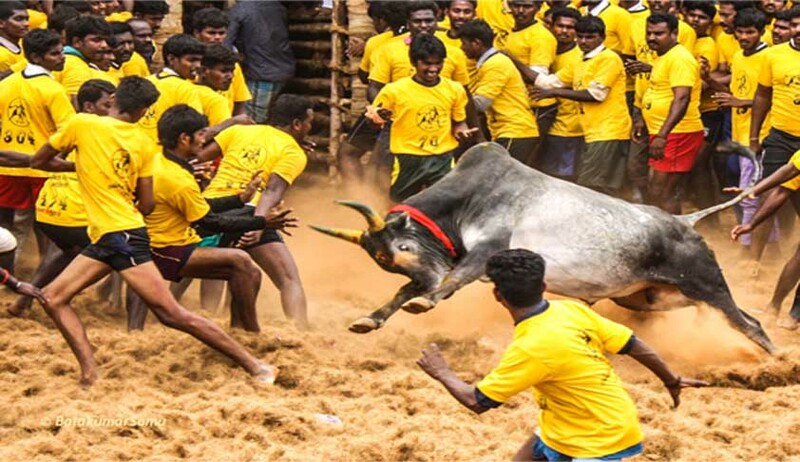 The Supreme Court on Tuesday issued an interim stay on Centre’s notification which had paved way for engaging in the banned bull-taming sport, Jallikattu during Pongal celebrations in Tamil Nadu later this week. The Court also issued notices to the Centre, and States of Maharashtra and Tamil Nadu, demanding a reply in four weeks. The Bench prima facie agreed that Jallikattu is “inherently cruel”. The case was heard by a Bench comprising Justice Dipak Mishra and Justice N.V. Ramana, after Justice R. Banumathi recused herself from hearing the case this morning. Justice Banumathi was a part of the Madras High Court bench which had banned the sport. The notification, which was issued on January 7, had excluded bulls from the list of animals that were banned from public display, thereby giving a go ahead to the sport during Pongal. “Bulls may continue to be exhibited or trained as a performing animal, at events such as Jallikattu in Tamil Nadu and bullock cart races in Maharashtra, Karnataka, Punjab, Haryana, Kerala and Gujarat in the manner by the customs of any community or practiced traditionally under the customs or as part of culture,” the notification stated. Slamming the notification, PETA India Chief Functionary Poorva Joshipura was quoted as saying, “"Terrifying and injuring bulls is abuse, not sport, and this combined with the injuries and deaths of people common at jallikattu events puts a bloody stain on India's reputation in the eyes of the world. This notification has been challenged by the Animal Welfare Board, People for Ethical Treatment of Animals, or PETA, and 11 other organizations. Contempt petitions have also been filed, arguing that the notification violates the ban imposed by the Supreme Court in 2014. A caveat has been filed by Tamil Nadu Government, requiring it to be heard before any order is passed on the issue. The Centre has challenged the maintainability of the petitions, contending that the Petitioners’ Fundamental rights were not being violated. It was submitted by Attorney General Mukul Rohatgi that the impugned notification incorporated safety measures to be taken during the sport, and that this was not “bull fight of Spain”. As per the notification, permission needs to be taken by the District Collector or the Magistrate and bullock cart races are necessitated to be held on proper tracks. Further, the bulls are supposed to be within a radial distance of 15 metres once they leave the enclosure. Performance enhancement drugs are not to be administered to the bulls, the notification had said. It was also reported that a day before the hearing, a number of non-official members of AWBI, including its chairman Major General (retired) Dr R.M. Kharb, were asked by the environment ministry to either “not go against the government” or “resign” from the board. “The chairman was asked how AWBI, which functions under the environment ministry, could go against the government. He was told to either withdraw the petition or resign,” a source was quoted as saying. None of the officials have however resigned. “We are a statutory body with the mandate to take up the cause of animal welfare… Jallikattu is a cruel sport and we will raise our voice against it. Otherwise, we will fail in our job,” an AWBI official told HT. Jallikattu, also known Eruthazhuvuthal is a bull taming sport played in Tamil Nadu as a part of Pongal celebrations on Mattu Pongal day. PETA India has recorded in AWBI authorized inspections that during jallikattu, terrified bulls are often deliberately disoriented by being given substances like alcohol, having their tails twisted and bitten, being stabbed and jabbed by sickles, spears, knives or sticks and being punched, jumped on and dragged to the ground. Three bulls died during jallikattu events in 2014. During races, bulls are often hit with nail-studded sticks and pushed beyond the point of exhaustion. In Goa, a round ends when one of the bulls manages to flee (or is killed), PETA India said. The Court had further categorized bulls as not being performing animals, “anatomically not designed for that, but are forced to perform, inflicting pain and suffering, in total violation of Sections 3 and Section 11(1) of PCA Act”. You may read the judgment and LiveLaw story here.